Keeping up with the latest trends and communication tendencies, and in order to get to even more people interested in his message and activities, Alvaro Noboa has joines the biggest Social Network in the world: Facebook. You can be a part of this big community on Facebook, in which you will be able to get updated information on his latest activities on philantropy, business, politics and family life of Alvaro Noboa, the biggest employer of Ecuador. 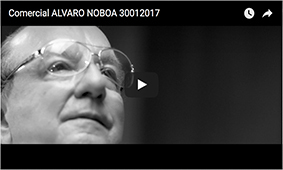 We invite you to go to the Official Facebook Community Page of Alvaro Noboa and become a fan by clicking “Like” and thus support the activities Alvaro Noboa does day after day for the greater good.